At Wawa we believe in being a ‘localist’, being proudly local and supporting the local community. Not too long ago our shopping habits were very different from what they are today. We used to go to the butcher to get our weekly meat, we used to grow our own vegetables, and our clothes where made by the tailor down the road. These days we don't know who makes our clothes, what happened to the meat we eat, or how the vegetables were grown. By not knowing, and not demanding to know, we are trusting that what we are paying for has been produced fairly and safely, but we are in fact leaving this up to chance. As most products these days are imported, we are not only buying something 'blindly', but we also seem to forget that by importing we’re increasing our environmental impact, as well as effectively exporting our money. As consumers we have more control over what is available to us to buy than we might think. As consumers we collectively choose to keep products and services available on the market as we create the demand. However we often seem to forget this incredible power that we have. With this power we can control the economy and also create jobs, by the simple act of being a ‘localist’. By buying locally we not only contribute to our own communities immediate economy, but we are also ensuring that our communities 'spirits' and unique qualities live on. There’s something really nice about personally knowing the carpenter that made the chair that you sit on everyday, you know he took his time to create it with love and care, and these qualities matter. You also hope and are pretty sure that the money that went to him will be circulated back into the local community. For a sustainable future we need to start caring for our local community and that means supporting the businesses within it too. Be proudly local, support local businesses and let’s grow our local community together. 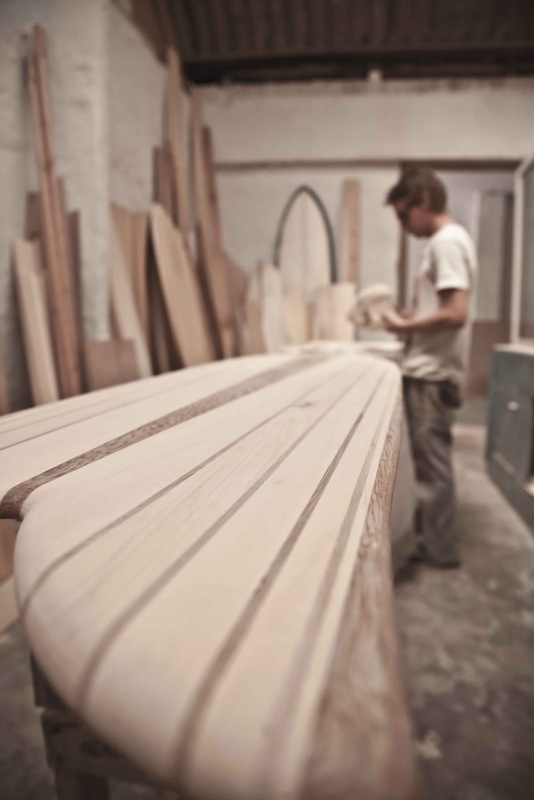 Wawa is a surfboard company based in Muizenberg, producing locally made wooden surfboards, celebrating the old craft whilst riding the waves towards a sustainable future. Should we envy the beginner surfer? Sure, he’s looking stupid as he ploughs into the trough, cheeks puffing and eyes shut as faceplants off the nose of foam-topped learner model. But, that guy has so much stoke ahead of him. In a few days or weeks, he’ll wobble to his feet and ride out a foamy. Soon, he’ll set a rail on a clean face for the first time, and then he may even start wiggling out a few shallow turns. He may be balding and grey, but in those moments he will be a young boy again, full of all the youthful wonder of the world. And that, is worthy of envy. “It’s like going through a second childhood,” says Andrew Strode, shaper for Wawa surfboards, a Muizenberg operation specialising in Alaias, Paipos, and handplanes. “I find myself looking for waves where I never would have in the past. And then kicking out of them giggling like a 10 year old.” As surfers, I believe we drink from the eternal fountain of youth. I’ve shared the water with men who wear the creases of long summers decades past, but also the cheeky grin of the kid who knows he’s getting away with an extra scoop of pudding. Sometimes we tend to forget this joy as we mutter about our adult commitments, the unaccommodating forecasts, or sheer number of our brethren we have to divide our limited waves and time with in the water. But, the further to the fringes you look, the more opportunity you will find. So would we want to wipe our slate clean and start again? Could you go back to catching a handful of waves and be stoked only with the success of riding them out? Alaia’s and Paipos offer a way of doing this, but still keeping your current skills on the rack for when you want them. On my first session on a Paipo with them, I find myself claiming a foamy ride-out. Kook behaviour, for sure. But, I just don’t care. It’s not easy – but then neither was it the first time you took out that mini-mal into the shorebreak. But, the rewards come. The first time you find the open face of the wave… you know the feeling. You’ve had it before once. And you can have it again now. “It strips you of your ego and reconnects you with why you started surfing,” explains Andrew when I eventually catch up to him at a more favourable peak further down the beach. This truth is also apparent. A little humbling is good for you. Just being out there with the boards, immersed in an ocean that was so familiar until this morning takes me back years. The boards themselves go way back. Alaias have seen their fair bit of press after being resurrected by Tom Wegener in Australia. Paipos have been more underground. The word itself doesn’t appear in any Hawaiian literature and is thought to have one of two origins. The first is that it means to ride a wave head first – prone like a bodyboard. The other is when it’s translated to ‘night landing’. Paipos were the chosen craft of spies who would surf into hostile villages undetected and then easily conceal their boards while eavesdropping on the enemy. A bit spicy, I reckon. Apart from Hawaii, and perhaps Tahiti, this prone form was the only style of wave-riding. It was simpler and easier. Some schools of thought believe that standing was reserved for royalty, and prone was for commoners. Others put the split was between adults and children. Anyway, the Duke, standing tall and proud on an Alaia, captured the popular imagination of what surfing should be. Paipo riding did have its followers though and spread from Hawaii quicker than the more challenging stand-up Alaia riding. George Bernard Shaw, founder of London School of Economics, and winner of both an Oscar and a Nobel prize, took in a dawnie at Muizenberg early on March morning in 1932. But, it was Wally Frosieth and Valentine Ching in the 1950’s that would get to their feet and set the ball rolling for David Nuuhiwa, the Aikau brothers, Buttons, Larry Bertleman and other luminaries to follow suit. From these roots grew a tangled tree of criss-crossing branches. Some saw bodyboarding as taking over, using buoyant flexible materials. Others saw a modern reincarnation in the fish. Neither would be wrong. Fishes have a genesis credited to Steve Lis in the early seventies, and were intended as hybrid kneeboard/stand-ups, but were themselves inspired by the work of visionary Bob Simmons, who is sort of a godfather figure to paipo enthusiasts. Bodyboards, short and fins-free, certainly carry Paipo in their DNA. And dropkneeing and then stand-up bodyboarding, if not a precursor to the current fins-free movement, definitely harbour the same philosophy that underpins it. Wawa is a collaboration between Cobus Joubert, David Hidi, David Constance and joiner Andrew Strode. The David’s go well back in the board game. Hidi is a Capetonian who first worked for Stubbs and then under legendary glasser, Curly. Constance’s experience goes back the 60s. A Durban boy, he was experimenting with multiple fin set-ups long before it was the norm. 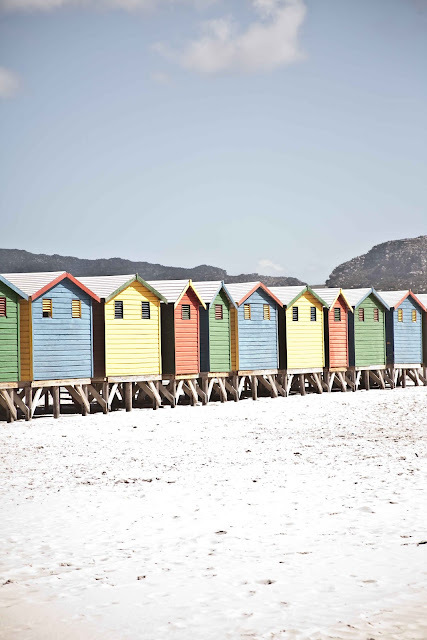 Cobus' fascination with the ocean goes back to holidays spent at their family cottage on Robberg Beach. On the dunes overlooking The Wreck, no electricity or running water, a long drop and plenty of warm water peaks to choose from, holidays were a heavenly experience. With only a single proper Handgun shared between four brothers and dad, flip-flops often changed from footwear to wave-toy. Now, a trader in wine, Wawa Wooden Surfboards is a passionate affair. A fellow farmboy, but from up on the North Coast, Andrew began working with wood and making furniture on his parent’s indigenous tree nursery. In looking for a change in life, Cobus spotted him cruising down the street in Kalk Bay with an Alaia and the two got chatting. With their respective skill sets, wawa was born in March 2011 in a spare room in Cobus’ home. It didn’t take too much saw dust in the house, before a space was rented in Muizenberg adjacent to where David Stubbs creates his magic craft. From there the business has grown organically. The handplanes began as an outlet for their offcuts and in it they’ve found a niche. Going for between R700 and R1800 they’re moving faster than the boards in these tough climes – from shops at least. In the water, not much beats a planing alaia. The planes occupy a space of their own though. It’s something you can keep in your car, or chuck in your bag for when the opportunity knocks. Meeting on the beachfront postponed? Couples weekend away dragging on? Your plane can be your release. It’s simplicity is it’s draw. A dumping shorebreak becomes as real option and pulling into a barrel is as easy as find a hollow breaking wave. Keith Malloy is credited with reviving this as an escape from surfing. The fact that there’s absolutely nothing showy about it means you are only focussed on one thing – having fun until you are sut! Get hold of Keith’s film Hell or High Water to see exactly what he means. Wawa’s philosophy is to use what’s at hand, rather than to ask what is wanted. It goes back to the resourcefulness of simpler times, when broken things were fixed, and available materials were the chosen ones. “It’s awesome to try out new woods. South Africa has a lot of great woods to use, but there are also alien species in gardens and farms that get the chop. By turning it into something lasting, something pleasureable, we really feel like we’re creating a great outcome for it.” Wawa itself is the name of one of Africa’s most exported woods. It’s more commonly known as obeche and has all the right properties for solid wooden boards. Yet, in keeping true to their beliefs, they prefer to use locally planted trees that are being felled already. The most used are swamp cyprus, pencil cedar, and kopak. The most beautiful board they show me is made of Himalayan cedar. It came from a tree on a farm on the North Coast that had been sold and was facing the developers’ bulldozer. With a solid piece of rich knotted auburn Andrew has crafted a Paipo that has the sun shimmering off the irregular grain. It’s beautiful. “That’s one expensive cheeseboard,” I quip. It’s an inappropriate remark from such workmanship. Cobus looks at me deadpan. “Ja, but then there people who pay nearly as much for cheeseboard.” I’m put in my place. Starting at R4000 and going up, these boards aren’t for everyone. But, then if you take a different approach to your board buying, you may come round. “These boards last,” explains Cobus. “If you look after it – and they need no more care than a regular board, there’s no reason why you can’t pass it on to your children or even grandkids.” When not in use, they look amazing hanging on a wall. “Like an artwork, it can be heirloom. But better than a painting or sculpture, it’s functional – you can really have a good time on one of these.” When you buy one of these, you’re not making a purchase. You’re investing – in quality workmanship and your own surfing. And it’s not just visual appreciation. Like fine wine, there’s a near total sensory experience with these boards. “When you drive to the beach, each board smells different. Like selected oak barrels in a cellar.” Then there’s the sound as the rail slices a glassy wall. You hear the water clearly, how the particular lines of your board peel it away. A normal board’s resonance interferes with this sound, so it’s drowned out. This is like a sole soprano silencing the auditorium at the start of the show. A silver blade touching crystal before the speeches begin. And the feel of them. Andrew reckons it’s the finishing of them that takes the most effort. “The shape is one thing, but I have to pay enormous attention to getting a perfect, smooth finish.” The attention to detail is evident in his work. Of course they feel completely different on a wave, but there’s also something to be said about how they feel beneath your feet. Like a sprung wooden floor… I don’t know… it just feels better on your soles. For Andrew, the tangibility goes beyond appreciation. He has macular degeneration – a retina condition which blurs the centre of his vision. He still surfs – well, but doesn’t drive and doesn’t know if it will get worse in his life. He has already taught himself to rely on feeling the curves, texture and flex of the boards he creates. Adaptation. The essence of evolution and the key to survival in nature and business. While surf shops fold, and shapers are forced to moonlight, these guys have gone out on their own path. It’s a risk, but then nothing great was ever achieved by persisting with the norm. Indeed, you can approach the surf craft as an evolutionary tale. It began with a single, simple origin and soon branched into new species. Some died quickly, others remained on the sideline, a few were wildly successful. But, in this, the landscape changed and so boards needed to change with it. While, wawa doesn’t seek to overthrow the dominant species, they see the opportunity on the lesser surfed fringes. As competition in the centre of surfing increases, both for waves and board sales, those out on the edge are branching out and away and finding new ways to enjoy different waves. I haven’t surfed Muizenberg in years, it’s just not my cup of weak milky tea. But with a Paipo under my arm, it’s like an espresso jolt and the ‘Berg can offer me stoke again. They’re also using the foam off-cuts from Stubbs and gluing these together to make new blanks which can then be used to make a recycled and buoyant core for the Alaias and Paipos. Cobus also tells me there are some more projects on the horizon, but we’ll have to wait and see what these might be. Nose on the nose, No grunting he-man pose. See how fast he goes! What is it he knows? Untitled Paipo poem posted in the signature line on the Paipo Forums by Uncle Grumpy. 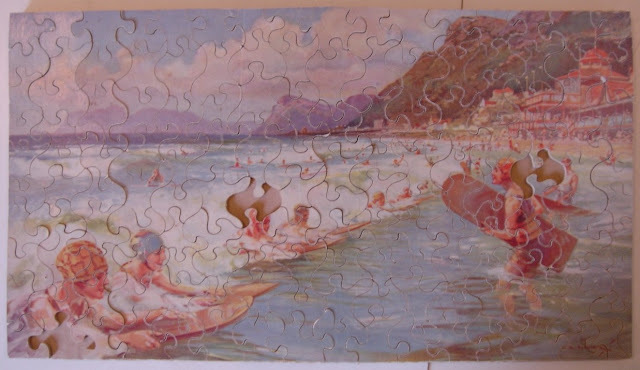 Jig-saw puzzle of Muizenberg surf late 1920's. Paipos and Alaia's enjoyed by all in the water.